Special Sections can add significant revenue to your publications. Good quality sections improve readership and appeal to new advertisers. Publishers-Edge offers a turn-key solution to producing good quality special sections for your newspaper and shopping guide. We make it easy for your salespeople to increase revenue. We have raised the standard for producing good quality special sections. Readers will find our articles filled with tips and information they will use. Whether making home repairs, planning for a wedding or preparing for retirement your readers will find our content useful and refer to this section of your paper again and again. We will send you a list of business market segments that should be primary target accounts for each section. Your sales force can use this information to focus on these businesses to generate additional revenues for every special section you publish. We include this prospect list of business categories with each special section package for no added charge. We realize our business is only successful if your business is successful. We understand print advertising sales and we know that even your best salespeople have a difficult time selling every special section you produce. They have their best success when they feel confident the section will benefit the advertiser. We have written sales scripts you can use both in Display Sales and Telemarketing. We have also written a benefit/value package for each special section we sell. We include this sales script and benefit/value list with each special section package for no added charge. Well, they may want to do a better job of selling than that, but it can be that easy. You receive a copy of the section already designed with ad space allowed for each of your salespeople to use when they are selling each special section. The pre-designed sections are tabloid format in full, process color. You can print the section from the electronic file on your laser printer for your salespeople to have on hand when selling advertising. Many papers have found that using a preprinted section with blank ad space pre-formatted results in more advertising revenue. Read what our customers have to say about our special section program. We make it easier to sell advertising in special sections. Use the order form on-line or contact us to order by mail. Click Here to use the order form now. Copyright © 2000—2012 Publisher’s Edge, Inc.
articles written to help your readers do almost anything. Click Here to view the list. 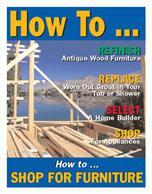 Written by experts, these “How-To” articles are informative and offer great advice. purchase the articles you need. Just $39 for each article includes a 500 to 800 word informative article with a corresponding photograph. Click Here to view the list. Order by Phone, Fax or E-mail. This may be your most popular special section ever! Too often our sales staff takes the selling process for granted when calling on customers. They walk in, start with a little light conversation about the weather, business climate or sporting event, then ask if they planned to advertise this week. This sets up the battle between salesman and advertiser. We have seen it happen time and time again even if the question is never asked, “Do you want an ad?” The question is implied silently when our sales staff walks through the door. This is evident when the customer holds his hand up from the back of the store and yells “Nothing this week!” Realize no advertiser “wants” to run an ad. What they want is more store traffic…increased revenue…better profit margins…or increased market share. They never want an ad. They want the results that advertising can provide. Log in here to download content for Special Sections and How-To Articles. New TOP TIPS Articles. A New Idea for a great Special Section. Click Here to see a Sample and the list of more than 200 TOP TIPS articles.